Why shouldn't the outside of a modern apartment building look like the inside of a Petri dish? South African architect Lindy Roy designed a very intriguing and elegant façade for the High Line 519 condominium apartment building at 519 West 23rd Street that employs curved, almost-amoeba-shaped stainless-steel screens that overlap floors in the center of the building's glass façade. The steel screens, or scrims, are in front of glass French doors, on the south façade of the building. The building's website described the screens as "perforated, embossed stainless steel balustrades [that] meander skyward, skimming the all-glass façade: a shimmering overlay distinct from the customary urban rhythms of stacked floor slabs and punched windows." The north façade of the building has balconies that overlook the High Line elevated railroad that is being transformed into a park. Dark wood paneling that the website proclaimed is "reminiscent of the deep rusty hue of the High Line trestle sheathes the building's west face." The building, which was developed by Sleepy Hudson, has 11 full-floor apartments with 10-foot-3-inch ceilings, video security and central multi-zone air-conditioning and recessed lighting and washer-dryers and walk-in closets. Two of the penthouses have wood-burning fireplaces and there is a garden duplex unit. The windowed master bathrooms have teak and ebony benches for storage, six-foot cast-iron tubs and the shower floors are slatted teak. The master baths also has Toscoquattro macassar ebony vanities with two sinks and Stark 2 wall-hung water closet. The Varenna kitchens have Canapa lacquer and Tortora glass cabinetry, Sub-Zero refrigerators and wine coolers and Miele appliances. The two penthouses have wood-burning fireplaces and there is a garden duplex unit. Ms. Roy's firm is Roy Design. She recently designed Vitra USA's headquarters and Hotel QT at 125 West 45th Street near Times Square for André Balazs. She was the winner of the Museum of Modern Art/PSI Young Architects Competition in 2001. 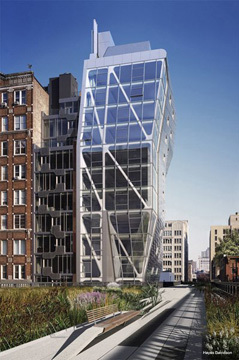 Although it is a relatively small project, it was one of the first with flair along the High Line.